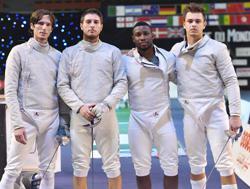 Team USA's Jeff Spear, Eli Dershwitz, Daryl Homer and Andrew Mackiewicz placed ninth in the team competition. Photo Credit: Augusto Bizzi. (Colorado Springs, Colo.) – Reigning World Championship silver medalist Eli Dershwitz (Sherborn, Mass.) retained his No. 1 world ranking as he and Jeff Spear (Wynantskill, N.Y.) led Team USA with top-32 finishes at the first World Cup of the season in Algiers, Algeria. The gold medalist in Algiers a season ago, Dershwitz was exempt from the preliminary rounds of competition due to his world ranking. In the table of 64, the 2016 Olympian faced Khalil Thompson (Teaneck, N.J.), the silver medalist at the October North American Cup, with Dershwitz edging out his teammate, 15-12. However, Dershwitz made an early exit in the following round with a 15-10 defeat against three-time Senior World bronze medalist Tiberiu Dolniceanu (ROU). Spear, the 2017 Pan American Championships bronze medalist, went 5-1 in pools and outtouched 2017 Asian Championships silver medalist Mohammad Rahbari (IRI), 15-14, to advance to day two. On Saturday, Spear defeated Misha Mardaleishvili (FIE), 15-11, before falling to fifth-ranked Sanguk Oh (KOR), 15-8. Oh went on to win bronze. Ranked No. 15 entering the competition, 2016 Olympic silver medalist Daryl Homer (New York, N.Y.) also was exempt from day one’s event, but he was upset in the table of 64 by Stefano Lucchetti (ARG), 15-14. In the USA Fencing National Rolling Point Standings, Dershwitz and Homer remain No. 1 and No. 2, respectively, while Spear moved up to the No. 3 position. Andrew Mackiewicz (Westwood, Mass.) currently ranks fourth. At just his second event on the senior World Cup circuit, eighteen-year-old Daniel Solomon (Lexington, Mass.) went 4-2 in pools to earn a bye to the preliminary table of 64, where he posted a 15-12 victory over Sebastian Cuellar (COL). Competing in day two for the first time in his career, Solomon drew No. 15 Fares Ferjani (TUN). Solomon kept the bout close, but couldn’t overcome the two-time African Champion, losing 15-12. Two-time Senior World Team member Peter Souders (Silver Spring, Md.) also finished in the top 64, his best finish since competing in the same tournament last season. After besting Fernando Scavasin (BRA), 15-12, Souders secured a place in Saturday’s competition with a 15-11 win over 2018 European Championships bronze medalist Dmitriy Danilenko (RUS). In the 64, Souders fell to two-time Olympic Champion Aron Szilagyi (HUN), 15-6. Dershwitz, Spear, Homer and Mackiewicz competed for Team USA on Sunday in the team competition, winning their final three bouts of the day to finish ninth. In its first match of the day, Team USA stumbled, losing in the table of 16 to Romania, 45-30. The United States was able to regroup in the 9th-16th place table, earning a victory over Colombia, 45-38. Team USA won or tied each of the first six bouts to take a 30-18 lead. Colombia won the next two, 18-10, to cut the gap to four, but the Americans shut the door on an upset, clinching the match with a 5-3 victory in the final bout. Up next was Ukraine. Although the Ukrainians secured an early lead, Team USA rebounded and took a 25-18 lead at the end of the fifth. Ukraine edged out the U.S. in the next two rounds, but Team USA won the final two bouts for a 45-34 victory. 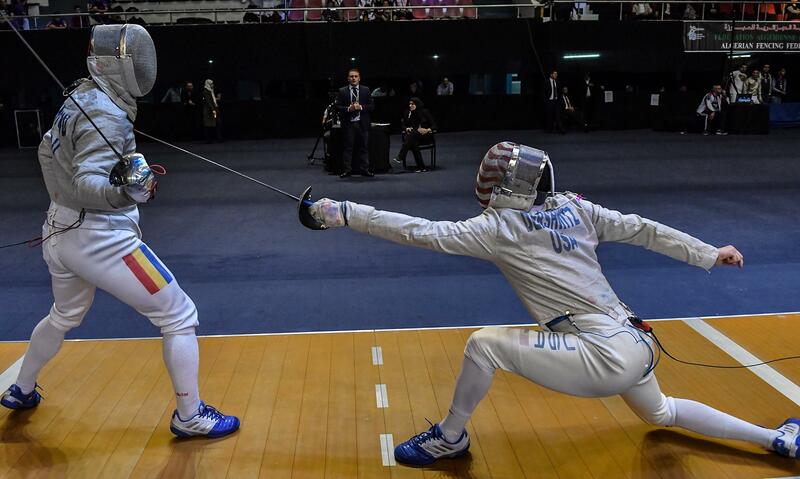 Fencing for ninth place, the United States dropped the first bout, but it would be the team’s only loss of the match as the squad went on to earn a 45-32 victory.